Our shop in Tallahassee uses the latest diagnostic technology to get your Volvo® on the road safely and quickly. Whatever your auto repair or auto maintenance needs, look no further than The Popular Mechanix, get in touch with us today! At The Popular Mechanix, our trusted technicians have years of experience on handling any auto repair and maintenance service for your Volvo®. Located in Tallahassee, our state-of-the-art shop is ready to serve all your auto repair and maintenance needs. We pride ourselves in our knowledge of Volvo® maintenance and repair to get your vehicle back on the road. 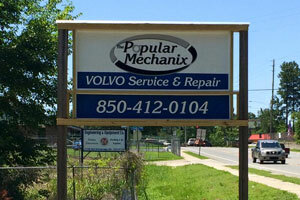 We are Tallahassee's finest independent repair facility, specializing exclusively in Volvo. We pride ourselves on the ability to repair or service most cars on the same day and carry a large inventory of new parts to insure quick and professional service. All work is done by competent mechanics in a clean well lit shop environment. Appointments are preferable. We are not affliated in any way with the Volvo ® Car Corporation. We use the term Volvo ® to describe the nature of our repair business.